Mother's Day is just around the corner, and that means it's time to pick out a special gift to honor the outdoor mom(s) in your life. Whether you're shopping for your mom, in-law, grandmother, sister, or a friend, we've rounded up a list of perfect gifts that will make any mom feel celebrated this Mother's Day. All of these gifts are available at our retail locations in Bryson City, Gatlinburg, and Asheville. Active moms spend a lot of time in the sun. This super-chic long-brimmed hat will help protect Mom's face and neck from harmful UV rays on all her outdoor adventures. Crafted with 100% paper straw. Internal ribbon band wicks moisture away to keep Mom comfy. Three striped weaves to choose from. We can't wear our river sandals and trail shoes to every event. These strapppy and elegant sandals are perfect for when Mom wants to dress up a little, while still showing her adventurous side. Leather wrapped footbed with embroidered graphic. Women's specific footbed for all-day comfort and support. Non-marking ChacoGrip outsole ensures excellent traction. Mom can go straight from the trail to town in this ultra-soft cotton dress from The North Face, available in three stylish colors. Bonus: it can go in the washer and dryer. Drawcord at waist for perfect fit. Two hip hand pockets keep trail maps and other small items handy. Hydration is a key part of staying happy and healthy on any adventure. Help Mom hydrate in style with this sleek, 20-ounce bottle. Vacuum insulation keeps drinks cold for 24 hours, or hot for six. Convenient varry loop for on-the-go hydration. Sweat-proof insulation for non-slip grip. 18/8 stainless stell and BPA/BPS/BPF free. Want to give Mom a great family experience to go along with her new gear? Surprise her with an adventure she'll never forget. 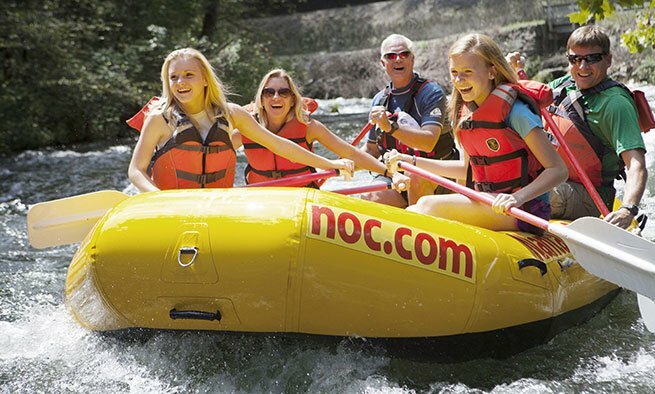 NOC offers multiple aerial and zip line trips to fit every family and budget. Families with young kids will love NOC's Treetop Adventure Nets, the country's first 100% net-based aerial playground. For more excitement, test your skills at the Zip Line Adventure Park, a challenge course with 16 aerial obstacles and the 500-foot Wesser Zip. For the ultimate adventure, fly high on NOC's Mountaintop Zip Line Tour, with two miles of spectacular zip lines that get you above the forest and into the open air. Or, combine a zipline trip with our world famous rafting for the perfect day of adventure.